The possibilities for 3D printers are endless. With the right printer and the know how you can virtually print anything, so how come we are not all rushing out to buy one? And if we did what would we do with it and what would owning a 3D printer at home entail? Why are 3D printers not yet a household item? The general public doesn’t really know enough about 3D printers. People don’t see the need; the printers haven’t become an essential household item yet. 3D printers are expensive so no one is going to buy one “just to see what it’s like”, they need to know that they will use it and it will be useful. Lack of publicity is another reason we don’t see 3D printers on every kitchen work surface. We are not being “sold” 3D printers in the same way vacuum cleaners, washing machines and TVs are advertized. We could live without a toaster or juicer in the same way we could live without a 3D printer yet we choose not to. Cubify seems to be gearing their advertizing towards the home user with slogans like “safe for kids in the home.” Yet you would have to visit their site to learn about the printer, it is not advertised in the mass media. What could you do with a 3D printer at home? If you are a hobbyist or simply creative and open minded then having a 3D printer at home could not only be fun but also profitable. Thousands of people make a living designing and printing 3D items at home to sell online. If you are not so creative you could use any of the 40,000+ designs on sites like thingiverse.com. If you get skilled at 3D printing you could offer your 3D printing services to others and start a small business from home. Although you probably wouldn’t be printing up household items daily the printer could come in handy if you need to replace parts in the home or decide that you need a new item. Should you get a 3D printer for home? If you have no experience with 3D printers you should start by educating yourself, reading a lot about the technology. Try designing a 3D object and getting it printed by one of the online 3D printing services. 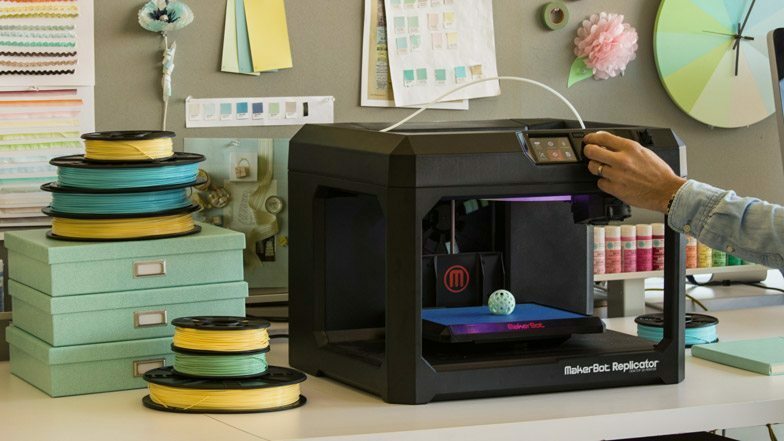 Don’t rush into purchasing a 3D printer, consider what you would use it for and whether you really need to own one or if you could simply continue using online and high street 3D printing services. Once you have decided that you have to have one you need to consult with an expert about which 3D printer suites you best. 3D printers are not cheap; they are an ongoing investment. In addition to the initial cost of the machine you will need to spend money on maintenance and refilling the printing material. Cubify seems to be geared towards the home market. They advertize on their site “Print what you use. Print what you wear. Print for your home. Print for those you love. Print for your life. Love what you make.” And I have no doubt in the future that is exactly what we will do, print from the comfort of our own homes.